Radley Dot Pocket RY4024S is an amazing and trendy Ladies watch. 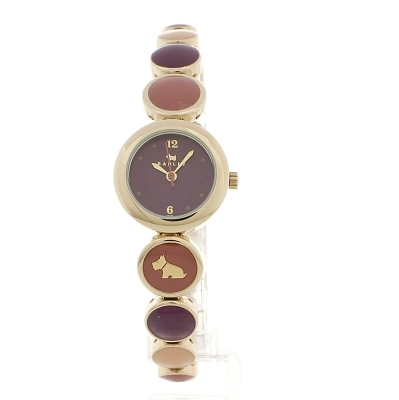 Case material is PVD rose plating while the dial colour is Purple. 30 metres water resistancy will protect the watch and allows it to be worn in scenarios where it is likely to be splashed but not immersed in water. It can be worn while washing your hands and will be fine in rain. The watch is shipped with an original box and a guarantee from the manufacturer. What a loverly watch, I bought it as a surprise present for my wife coming out of hospital. It certainly gave her a lift, again, a very very nice watch. This is a great everyday watch. Easy to remove the extra link to make the bracelet smaller. Only slight disappointment was that the photo on the website made the bracelet look purple & orange but its actually purple & dusky pink. Radley was established in 1998 as a quintessentially British fashion brand inspired by life. Beginning with a stall on Camden Market, founder Lowell Harder quickly began to build a brand and Radley was born through a desire to see women's accessories that step outside traditional colours and styles for a bolder, brighter look. The Radley collection of ladies' watches feature the instantly recognisable Scottish terrier, a logo that was decided upon after a search for an icon that would accurately represent the playful nature of the brand. Radley watches was launched in 2011, bringing feminine style and sprightly, cheerful design ideas to the wrists of women everywhere. The distinctive Scottie logo combines with contemporary colour and style for a range of day and evening wear watches that are both expressive and fashionable. Watch Shop is an authorised Radley stockist. Sign up to receive email updates when new styles of Radley are added to Watch Shop!